One the favorite traditions of my children growing up was posing in true martial arts style with the Power Rangers. 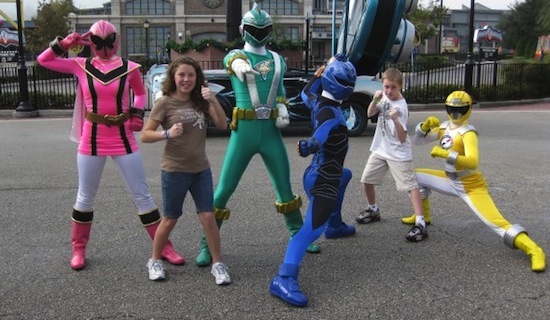 We would schedule our park time around their meet schedules at Disney’s MGM Studios (now Disney’s Hollywood Studios) so the kids could meet each ranger. The Power Rangers would arrive in a well-themed car (Now the Phineas and Ferb vehicle at Disney California Adventure) with the theme song blasting, and pose with kids along the Streets of America. Sadly, those meets went away when Disney sold the Power Rangers franchise back to Saban Entertainment for a tidy profit. But, your kids can still have an opportunity to meet the Power Rangers and take those same karate style photos with the Nick Hotel’s Power Ranger Weekend! The weekend will take place from Nov. 16 to 18 at the Nickelodeon Suites Resort in Orlando. Power Up with a Power Rangers Brunch – Guests will enjoy a brunch, meet all six of the Power Rangers, get autographs, have their photo taken with their favorite Rangers, and practice special Ranger training moves. Available Nov. 17 and 18. Four sessions to choose from: 7:30 a.m. – 8:30 a.m., 9 a.m. – 10 a.m., 10:30 a.m. – 11:30 a.m., or noon – 1 p.m. Space is limited. Exclusive Meet & Greets – Meet your favorite Power Rangers and have your photo taken together. Autograph cards available during signing. Dive-In Movie – Watch an episode of Power Rangers Super Samurai on the big screen by the Lagoon Pool. Available Nov. 16 and 17 beginning at 8 p.m.
Video Game Showdown– Put your gaming skills to the test at our Video Game Showdown in Studio B. Available from 7 – 8 p.m. on Nov 17. Practice those karate moves and meet the Power Rangers! You can see more of our family photos here. • Kenny “The Pirate” White is an avid fan of the Orlando theme parks. He specializes in Disney character and entertainment schedules and information. He and his family have met more than 220 different Disney characters and numerous other theme park characters over the years. Kenny and his family visit Orlando regularly. He currently lives in Florence, S.C. You can visit his blog at kennythepirate.com.